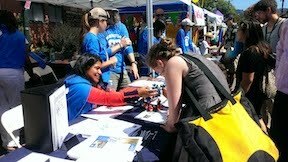 May 17-18, 2014: We exhibited at Maker Faire Bay Area. Download flier. Apr 26, 2014: Talk and hands-on with students in grade 7-10 (to students from Johns Hopkins Center for Talented Youth). Apr 12, 2014: We exhibited at Lawrence Hall of Science. Featured Makers in NanoDays. 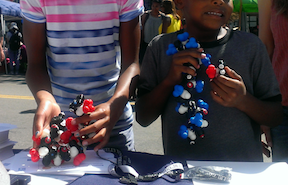 Sep 08, 2013: Outreach with Peppytides in the Berkeley Lab booth at the Solano Stroll 2013. Aug 26, 2013: Work on Peppytides featured in Berkeley Science Review blog. Check out this nice post here. Jul 29, 2013: We have made available through this website, all the files and steps needed to make a Peppytide model. Abstract: Although nonflexible, scaled molecular models like Pauling–Corey’s and its descendants have made significant contributions in structural biology research and pedagogy, recent technical advan- ces in 3D printing and electronics make it possible to go one step further in designing physical models of biomacromolecules: to make them conformationally dynamic. We report here the design, construction, and validation of a flexible, scaled, physical model of the polypeptide chain, which accurately reproduces the bond rotational degrees of freedom in the peptide backbone. The coarse- grained backbone model consists of repeating amide and α-carbon units, connected by mechanical bonds (corresponding to φ and ψ) that include realistic barriers to rotation that closely approximate those found at the molecular scale. Longer-range hydrogen-bonding interactions are also incorporated, allowing the chain to readily fold into stable secondary structures. The model is easily constructed with readily obtainable parts and promises to be a tremendous educational aid to the intuitive understanding of chain folding as the basis for macromolecular structure. Furthermore, this physical model can serve as the basis for linking tangible bio- macromolecular models directly to the vast array of existing computational tools to provide an enhanced and interactive human– computer interface.